2002 and 2009 all rights reserved please do not copy. E-mail me for reproduction info. ESTRELLAS EN EL FUEGO!/STARS IN THE FIRE! a big thank you to Bob Heman and Erika Dagnino, Curator. Also! I have a NEW ChapBook out available through me! 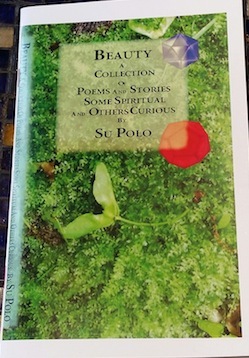 Beauty ~ Poems and Stories, Some Spiritual and Some Curious by Su Polo $10. includes postage. Please let me know if you want one! 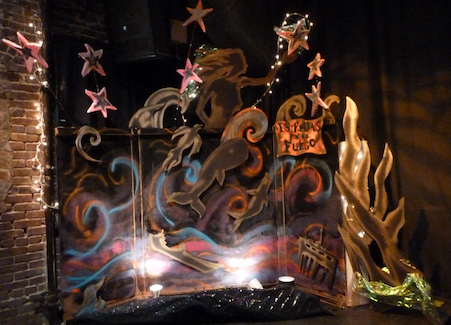 the 25th annual Alternative New Year's Day Poetry and Spoken Word Extravaganza. (between Seventh Avenue South and Bleecker Street) in Greenwich Village. Tuesday, January 1, from 1 to 9 p.m. More than 140 scheduled performers, an open mike and books for sale. Buy books, buy books, buy books. Please watch for posted updates! Happy New Year! Thank you for making 2018 great at SATURN! 2 or 3 features Plus Open Mike! RLOVENTO IS HAVING THE BUILDING GET THE GAS TURNED ON. THIS VENUE HAS STAIRS. WE HOPE THIS IS BACK TO NORMAL SOON. WHILE BARLOVENTO IS HAVING THE BUILDING GET THE GAS TURNED ON. THIS VENUE HAS STAIRS. WE HOPE THIS IS BACK TO NORMAL SOON. SEE YOU AT CURRY IN A HURRY! 5 minutes /person Open Mic plus 2-3 features. $3.00 donation requested plus a drink or Food purchase to support this great venue. Monday Dec. 17 wtih Su Polo and Jay Chollick and HOLIDAY PARTY! Be the happiness you are today! Ms. Edi Holley at St. Johns Church on March 19, from 12:30 to 3pm with Special Guests - Bill Duke and The Angel Band + open mike. The book, BILL PYLES, HIS LIFE, HIS POETRY, COMPILED BY EDI HOLLEY is available on Amazon. John Lehmann-Haupt new CD is here - Songs of the Guitar II. Some of you may remember his beautiful guitar feature at Saturn Series Poetry. As on the first Songs of the Guitar, He offers a program that covers a lot of territory, with transitions that work in unexpected ways - from a traditional ballad to Bach, from the distant chime of Debussy's "Et la Lune Descend" to the warm murmur of Tim Hardin's "Misty Roses," from Stevie Wonder's subtle, slinking "Creepin'" to the sweet blues of Jimmy Reed's "Honest I Do." and iTunes and CDBaby as well. There is a lovely memorial essay about Ray Pospisil, extraordinary metrical poet who passed away January 28, 2008. Seems like only yesterday he was sitting at the corner of the bar at the Saturn Series Poetry Reading at Nightingale Lounge on 13th Street and 2nd Ave.
Monday, Jan. 29 with NO REEADING We will reschedule April Jones soon! * Monday, Jan. 18 with Austin Alexis, Bernard Block - MLK Day Theme": Commemorating Martin Luther King"
with George Held, Anoton Yakovlev and Claudia Serea "The Fab 4"
* Monday July 4 with CANCELLED - Go out and see the fireworks! * Monday July 11 with Michael Schwartz, Diane Block and Bernard Block "Memory and Myth: Brooklyn, Long Island, Island of Coney"
THANK YOU ALL FOR COMING TO OUR SHOW! 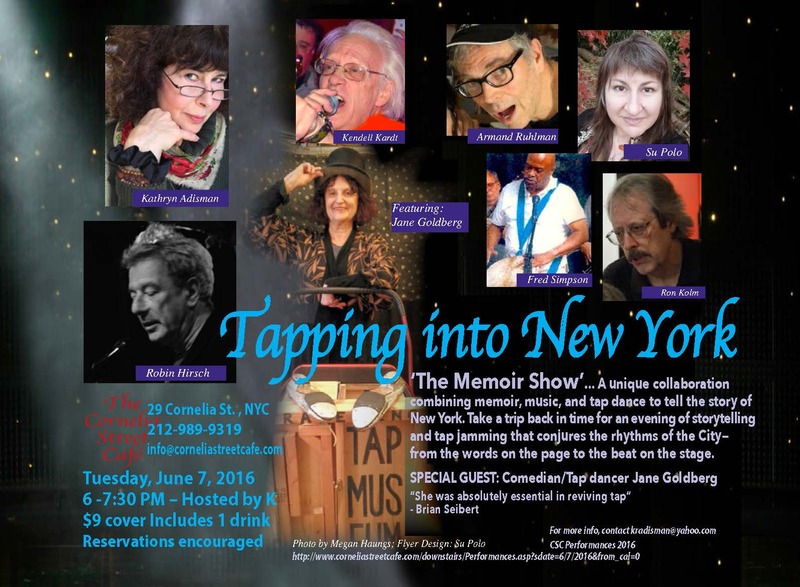 TAPPING INTO NEW YORK… is back! A unique collaboration that combines memoir and tap dance to tell the story of New York, then and now. Come hear an evening of storytelling and tap jamming that conjures the rhythms of the City – from the words on the page to the beat on the stage – evoking unforgettable scenes in the cinema of the imagination. A full day of Free Fun! SEE YOU NEXT YEAR AROUND UN PEACE DAY! Su Polo will be performing late morning with a host of international performers - This is a family friendly, day long FREE event for Peace and ecology. 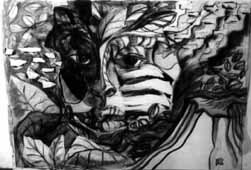 Music, Dance, Art, Childrens' big drawings to do. Fun! Join us for this great ceremony of Peace on the U.N. Official International Day of Peace. Saturn Series Poetry Reading & Open Mike meets Every Monday Night! 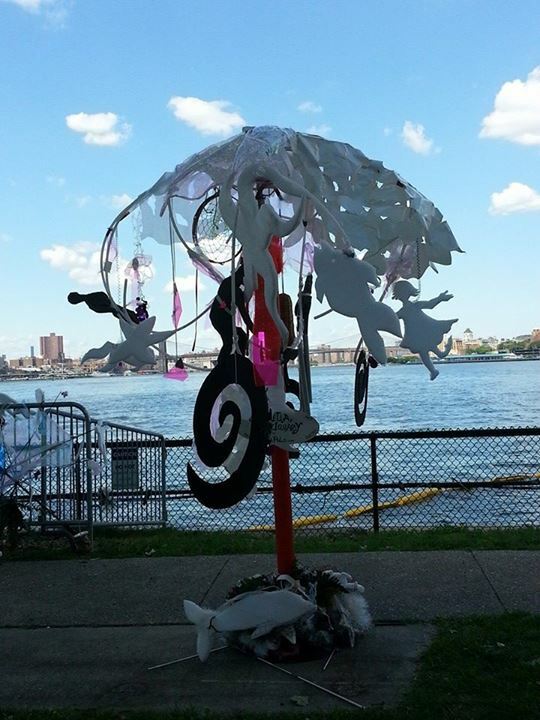 2015-THANK YOU to those who came to Figment.org on Governors Island June 6 - 7 only. "Sparkle Window" A Sculpture/Wind Chime by Su Polo - set up near the open mike hosted by David W. Jacobson by Castle Williams and across from the Gazebo. Figment is a fud day for a lunch outing with family and friends. C'MON! The Anthology is available by ordering online on our website, http://alternativenyd.org. Monday June 20. Four fabulous poets will read at Cornelia Street Cafe at 6 p.m.: George Held, Anton Yakovlev, Su Polo, and Claudia Serea. Come celebrate summer solstice with us! $9 Cover gets you a drink. Thank you for coming to the Vigil for International Peace and Environment! A full day of Free Fun! SEE YOU NEXT YEAR AROUND U.N. PEACE DAY! Please bring instruments ready for quick set up. Plus Feature artists to perform with open mike performers mixed in between. *Please note times are estimated with open mike mixed in. SEPT. 4: Nelson Alxndr , The Willie Wolf Band with Anne DeAcetis (who all brought the sound system for all to use and made this night able to happen) and Philip Lynch. And what a great night it was! Thanks go out to our features on July 3 - with Honor Finnegan, Karen Dahlstrom of Bobtown, Ariah Noetzel, and Stuart Markus of Gathering Time. Thanks to Chris Lowe, Yukio Tsuji, Sara Galas and Philip Lynch for a great night in Jan. Thanks to Daniel Cohen, David Massengill and the Willie Wolf Trio for a great night in Feb.